There was a time when Khorn Savai avoided caterpillars, convinced they would make her ill. Now she actively seeks them out. Khorn is one of a number of locals trained to breed butterflies by Banteay Srey Butterfly Centre, the largest sanctuary of its kind in Southeast Asia. In the garden surrounding her wooden stilt house on the outskirts of Siem Reap, her keen eyes know exactly where to spot the tiny eggs that will become caterpillars, before transforming into one of Cambodia's many stunning, but struggling, butterfly species. "Because I had no work, I decided to do this. Now I am used to it, I'm not afraid of caterpillars any more," she tells AFP. 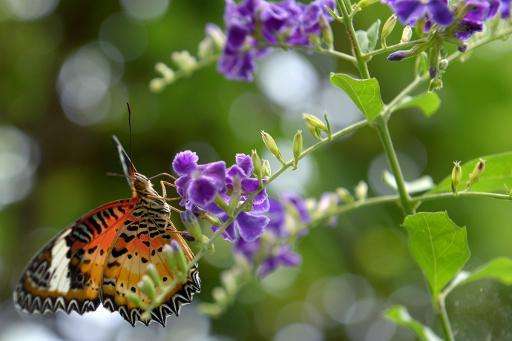 Those who step inside the sanctuary are greeted by a dizzying array of colours, as dozens of vibrant butterfly species flutter through the air or nestle on verdant foliage. But butterflies outside the sanctuary are not so lucky. Rampant illegal logging and timber smuggling have devastated Cambodia's forests, dealing a blow to many wildlife species—including butterflies. In its haste to develop the impoverished nation, the government has been criticised for allowing well-connected firms to clear hundreds of thousands of hectares of forest land—including in protected zones—for everything from rubber and sugar cane plantations to hydropower dams. The WWF estimates that Cambodia has lost around a quarter of its forests since 1973. "All around the world they have the same problem—butterflies are not increasing, they are decreasing," Lux Phem, Banteay Srea's manager, told AFP. In a bid to protect some of the country's most endangered species the sanctuary enlisted the help of local villagers, who are provided with a breeding cage and taught how to recognise some of the dozens of native species. In peak season, villagers like Khorn can earn up to $150 a month. "I love this job, I am happy because it is not hard work," she enthused, before adding: "If we don't breed them, there won't be any because of the deforestation."